The Mayflower Pilgrims used to be romanticized by just about all European Americans. But the contemporary viewpoint isn't nearly as positive. The more enlightened we become, the more we feel the need to repent for what happened to the indigenous peoples who had lived in the Americas for thousands of years before colonization began. And this means viewing Plymouth Colony in a more negative light. The fact of the matter is that neither the old, romantic notion of the Pilgrims, nor the contemporary condemnation we're increasingly accustomed to is correct. And, I think, a decent understanding of who the people were that celebrated that first Thanksgiving in 1621 might help us put our national holiday in better perspective. First, European colonization devastated the Americas. It was genocide, pure and simple—both intentional and unintentional. It was intentional in that the First Nations were forced off their land, enslaved, tortured, and viewed as a means to an end (the end being the amassing of wealth for European nobility). But even greater devastation came about unwittingly through the spread of disease against which American peoples had no immunity. And it is this latter form of genocide that comes into play when we study the Pilgrims' arrival in Plymouth Bay in late 1620—well over a century after first contact between Europeans and Native Americans. 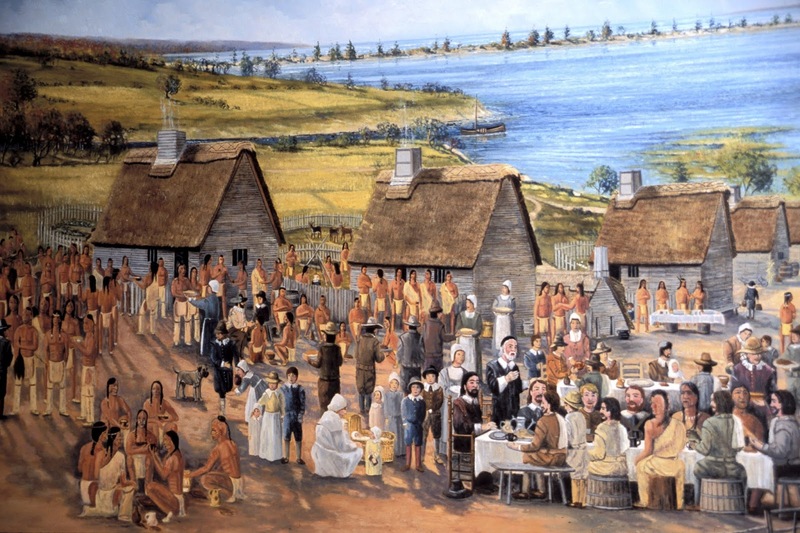 And the place where the Mayflower finally anchored had once been a village inhabited by a people called the Patuxet, who had been wiped out in an epidemic that had finally reached what is now New England—the same sort of plague that had already ravaged lands farther south. And it was here that they encountered a man named Squanto, who had been kidnapped by the English years before and finally returned to his homeland, only to find that his people had died, and that he was a man without a nation. The next-closest community was a people called the Wampanoag, and Squanto helped to make the connection between them and these Europeans, whose language he already knew. Since all native peoples had been devastated by epidemics, most of them in these northern climes were struggling to survive. The arrival of this new community was, therefore, seen as a positive development—people with whom to trade, for example. And so the Wampanoag and (especially) the man who was foreign to both sides—Squanto—aided them in their survival. 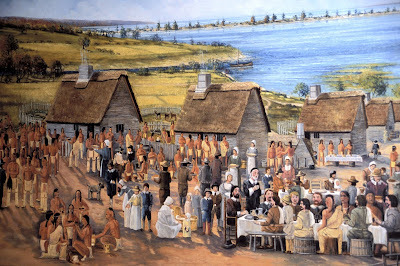 The Pilgrims needed the Wampanoag and the Wampanoag benefited from the presence of the English. The relationship was quite symbiotic. And the Mayflower Pilgrims truly were not interested in trying to convert the Wampanoag to their religion. The peace between Plymouth and the Wampanoag lasted for over a generation. Yes, it turned ugly in the end. But the picture we have in our mind—the one we've been taught—is not really incorrect: The first Thanksgiving feast was indeed a peaceful coming together of two distinct peoples who very much needed each other. Pressure on populations to leave one place and re-locate to another has existed since prehistoric times. I refuse to vilify all my ancestors who were forced from their old homes and had to move here. Most were victims of either religious persecution or poverty and ignorance. Others were either indentured servants or persons convicted of petty (by today's standards) crimes that resulted in a sentence of exile. So their arrival in North America was simply a necessary attempt on their part to survive—something that probably wasn't even a possibility in the places they were coming from. This does not excuse their subsequent persecution of Native Americans and Africans. But, once again, the community gathered around that first Thanksgiving feast can and—in my opinion—should be viewed as two things: Both a statement of what this country's ideals should have been, and a harbinger of how racial prejudice can invite ruin and judgment. Today's Americans seem increasingly willing to forget the very roots we so love to romanticize. We were strangers who received a welcome. And not only did we turn on those who welcomed us, but we now refuse to welcome other strangers whose reasons for coming to this land of promise are no less urgent and no less compelling than those who arrived on the Mayflower. And yet we fear them, and want to wall ourselves within our own borders. 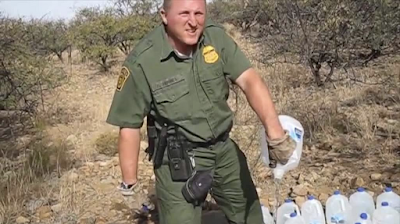 In an opinion piece in the Washington Post, Karen Tumulty wrote that "a wall is not going to give this nation the kind of immigration system it needs. It is time to think about building a table—and figuring out how to bring everyone back to it." A. The grateful Samaritan leper. B. Jesus' call not to worry, for God will provide. C. The bread in the wilderness. But I might recommend another, more ominous one: The parable of the ungrateful servant, who didn't have the grace to see himself in another, but instead refused to offer them the same grace that he had received from his lord. for thirsty people in Ajo, AZ — 40 miles from the Mexican border.